Two of Jupiter’s satellites, Europa and Ganymede, will cross the face of the planet on the evening of Tuesday January 10, as seen from the west coast of North America at 10:35 p.m. PST. One of the first sights new telescope owners often observe is the scintillating dance of Jupiter’s moons as they orbit the planet. Galileo Galilei was the first to observe Jupiter’s four bright satellites, and from them he was able to deduce that they orbited Jupiter. He grasped this as proof positive of Copernicus’ groundbreaking theory that the sun, not the Earth, was the center of the solar system. Most of the time we see Jupiter’s four bright moons strung in a line on either side of the planet, because we are viewing this miniature solar system edge on. Inevitably this means that most of the moons will also pass in front of and behind Jupiter once every orbit. When they pass behind Jupiter, the moons are sometimes in the huge shadow of the gas giant, and other times behind the planet itself. In either case, we cannot see them from Earth. The two outer satellites, Ganymede and Callisto, are darker than Jupiter, and so are visible as dark gray spots when viewed against Jupiter’s cloud banks. This can be seen clearly in the computer-simulated image here, where Europa, just entering the disk, is a bright white spot, while Ganymede, leaving the disk, is dark gray. The graphic depicts an actual transit which will be visible from the west coast of North America in the evening on Jan. 10. 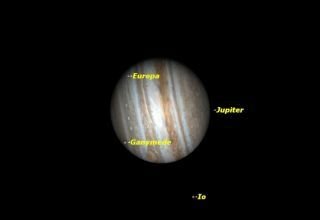 The event begins with the entry of Ganymede onto the face of Jupiter at 8:40 p.m. PST (11:40 p.m. EST; 0440 GMT Jan. 11). Incidentally, Jupiter's Great Red Spot will also be well placed for observation at this time. Ganymede will slowly cross the face of Jupiter until it is joined by the bright Europa at 10:25 p.m. PST (1:25 a.m. EST Jan. 11; 0625 GMT Jan. 11). By then, Jupiter will be low in the west, and will set soon after. Unfortunately for viewers in eastern North America, most of this event will take place after Jupiter sets. Ganymede will leave the disk of Jupiter at 10:47 p.m. PST (1:47 a.m. EST Jan. 11; 0647 GMT Jan. 11). Europa will follow at 12:53 a.m. PST (3:53 a.m. EST; 0853 GMT), but Jupiter will have set for most North American observers by then. Viewers in the far northwest may be able to catch the intensely black shadow of Europa as it begins to cross the disk of Jupiter at 3:03 a.m PST (6:03 a.m. EST; 1103 GMT). You will need to be in Hawaii to see the shadow of Ganymede join that of Europa slightly over an hour later, and to follow them across the face of the planet. Such a "double feature" with Jupiter’s moons is extremely rare, yet this is actually part of a series of similar skywatching events in 2012, culminating in August when half a dozen such events will occur. Unfortunately, in most cases, the whole sequence takes place over too long a span of time for an observer in any one location to catch it all, but there will be many opportunities for all of us to catch parts of the shows. While Jupiter’s moons are easily visible in even the smallest telescopes when they are "off-planet," they require a fair amount of telescope power to be seen while in transit. The satellite shadows, because they are intensely black, can be seen with a 90mm telescope. The darker satellites, Ganymede and Callisto, are visible with a 130mm telescope. In any case, you will need a magnification of at least 150 times to make them out. All these transit events are predicted in the Observer’s Handbook 2012 of the Royal Astronomical Society of Canada, and in most computer planetarium programs.